The cut of a diamond determines its brilliance and refers to its proportions, symmetry and finish. Whilst a diamond’s Colour and Clarity are dictated by nature, the Cut is determined by the human hand and is in our opinion the most important of the 4 C’s. The angles and proportions determine a diamond’s ability to handle and reflect light and generate brilliance. In a diamond that is well-cut, light enters through the table and travels through the stone where it is reflected from one side to the other before the light is returned back to the viewer’s eye. 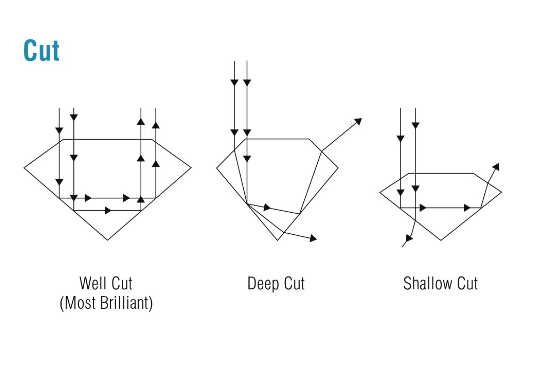 While Cut is the most important factor in a diamond’s beauty, unfortunately there is no uniformity in cut grading terminology between the major labs. Each lab uses its own terminology which can sometimes be confusing. For instance, GIA calls its top grading “Excellent” followed by “Very Good”, whilst other labs use the term “Very Good” as their top grade. A diamond graded “Very Good” by GSL, for instance, would therefore be the equivalent of a diamond graded “Excellent” by GIA. Whilst the grades are not identical, we generally recommend buying a diamond with a “Good” grade or better regardless of who has provided the certificate. Avoid diamonds with grades of “Medium”, “Fair” or “Poor”, as the alignment of their facets may misdirect light so severely that it affects the brilliance of the diamond.